Medical technology is catching up with science fiction in terms of machines performing medical procedures. Computers and robots are now becoming a major fixture in medical labs and doctor's offices. Although they cannot possibly replace a human doctor (within this timeline), they can assist medical personnel in diagnosing and even treating some medical conditions. This infographic by the Healthcare Administration Degree Programs touches on some of the medical marvels of machine, computer, and robotic technology. 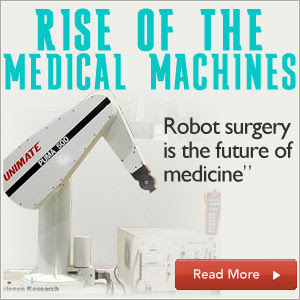 One technology that captures the imagination is robotic surgery. Much like the stories of the future, robots now can perform surgical procedures that were once considered delicate and complicated. It is a technique in which a surgery is performed using a computer that remotely controls very small instruments attached to a robot. The robot ensures more precise incisions since it mitigates some of the hand tremors and unnecessary movements if done by a human surgeon. Also, robotic instruments can access hard-to-reach areas of the body more easily through smaller surgical cuts compared to traditional open and laparoscopic surgery. Aside from those featured in the infographic, other medical machines that are now being used such as an iPhone ECG app, an artificial pancreatic system, and a pacemaker requiring no batteries can be found at the related links below.